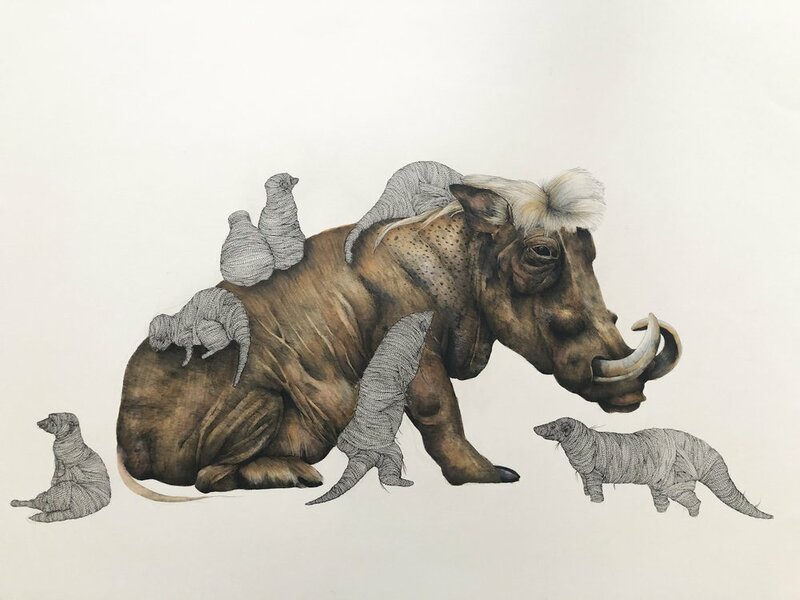 A solo exhibition about symbiotic relationships in the natural world. Good For You is a body of work highlighting the unexpected symbiotic relationships found in nature. As an artist, I am continually drawn to the mysterious aspects of our natural world. I seek to understand our natural environments better, and to share these beautiful realities with others. It seems that there are infinite lessons to be learned from the way that chemicals, bacteria, species, and ecosystems, interact. In an era where mankind feels fractured, I have found comfort in the natural and beneficial relationships between species in all types of environments. If these species can empower one another, we as humans should learn to peacefully engage with one another as well. All three types of symbiosis (mutualism, commensalism, and parasitism) can be found in human relationships, and in our relationship with nature. This show focuses on mutualism, where both entities are benefiting equally. I have fused two personal artistic styles, allowing familiar creatures to be seen in a new way. I seek to demonstrate the seen and unseen efforts and benefits that come from working interdependently with the planet and one another. My hope is that humanity will learn to be in a symbiotic relationship with our planet. Learning more about our natural world allows us to know and love the incredible earth we have more deeply, and care for it more fully. Parasitism: one gains while the other suffers. WARTHOG AND MONGOOSE || This unusual friendship was first discovered in Uganda. Warthogs will lie in mud and welcome the mongoose to come and pick off its ticks and other insects, ensuring the warthogs grooming and health, and the mongoose gets a meal. 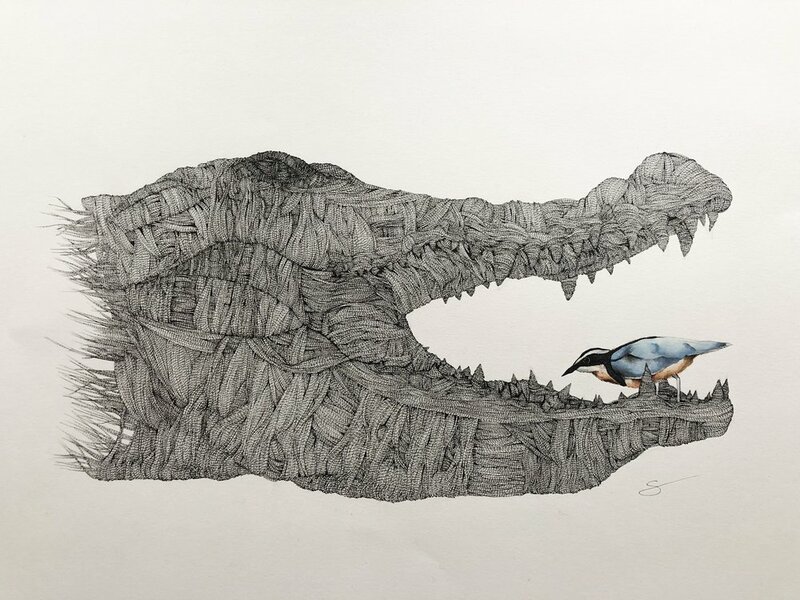 CROCODILE AND EGYPTIAN PLOVER || After a meal, crocodiles have been found to sit on the river bank with their mouth wide open. This signals the plover to enter and they clean their teeth by picking off food remains which prevents infection. The bird gets a good meal and the crocodile remains dentally hygienic and healthy. Their secondary function is that the bird easily senses danger and lets out warning cry’s that signal the crocodiles dash into the safety of the river where they disappear. SHARK AND REMORA || Remora are small fish that eat the parasites on the sharks skin and clean it’s mouth and teeth as well. They are also known to consume any scraps the shark may drop after a hunt. 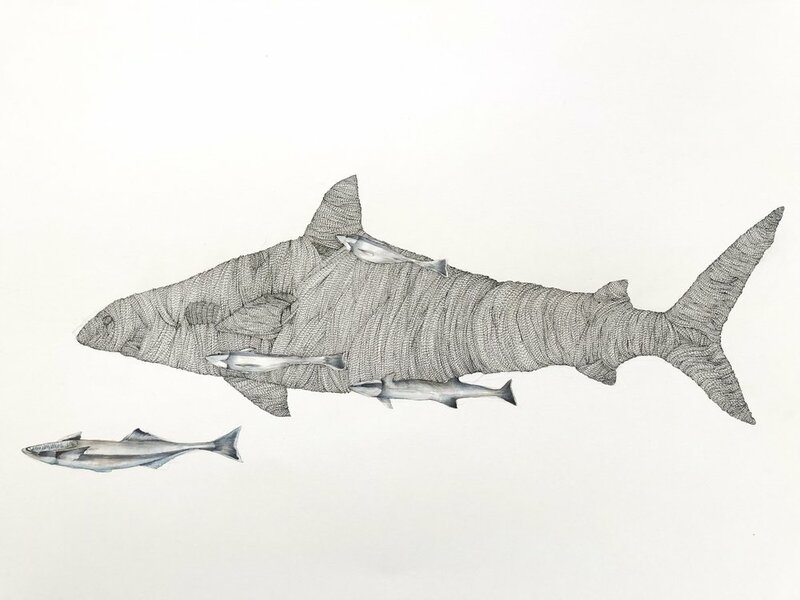 They keep the shark healthy, and in return they are offered meals, protection, and transportation through the vast arts of the ocean. Sharks recognize the need for the care of the remora fish so much so that if necessary they will risk danger in order to slow down and receive care. OSTRICH AND ZEBRA || Though they may be an unlikely pair, they balance each other well. Ostriches have poor sense of hearing and smell, while the zebra has poor eyesight. Together however they are a power couple and help each other avoid predators. What one lacks, the other shines in, together they help to keep each other safe. CLOWNFISH AND SEA ANEMONE || Clownfish rarely leave their anemone. During the day the clownfish will search for food near the sea anemone, and at night return to cuddle in its tentacles. It is immune to it’s sting and poison. In turn the Clownfish protects the anemone from Butterfly fish that eat anemones. According to National Geographic, new discoveries show that the clownfish also fertilizes the anemone with it’s waste. They also have found that the fish help the anemones breathe at night. Anemones rely on currents to provide oxygen and nutrients. Clownfish remain active during the night, allowing water to flow through the tentacles and for the anemone to receive oxygen and nutrients that are critical to its health and growth. GROUPER AND OCTOPUS || Much like the coyote and badger, the grouper and octopus are able to better catch prey together than a part. The grouper will find prey and signal to the octopus where the prey is hiding and together they trap the prey. A stunning documentation of this hunt can be found on Blue Planet II. COYOTE AND BADGER (not pictured) || Coyotes and badgers are known to team up to help each other hunt. Both species tend to lead solitary lives and tend to struggle with certain prey on their own. The elusive prairie dog and ground squirrel has led them to form this unlikely alliance. Coyotes will chase the prey into the grasslands. As they run from the coyote and attempt to find shelter in their home, the crafty badger greets them at the entrance of their hole, having tucked itself into their home. Together they ensure that both hunters don’t go hungry.